Sometimes the simplest changes to a basic recipe can bring about the most unexpectedly tasty results. I've always loved playing with candy recipes because they are so versatile and adaptable. Thanks to the crazy properties of sugar, a slight change (even something as simple as a few degrees of heat) can turn one confection into something completely different. Caramel is a perfect example. Raise the temperature higher and higher, and the flavor becomes deeper and deeper (until you reach that burning point.. then it's all over). So I was curious to see what I could do in terms of making a Caramel-based Sauce with Nutella and Chocolate. In the end, the process is fairly simple. Start by making a basic caramel. But rather than thin the Caramel with Cream to make the Sauce, add a smooth mixture of Cream and Cocoa Powder. Butter and Salt come next for texture and flavor. And finally, the mixture is further smoothed with Nutella. 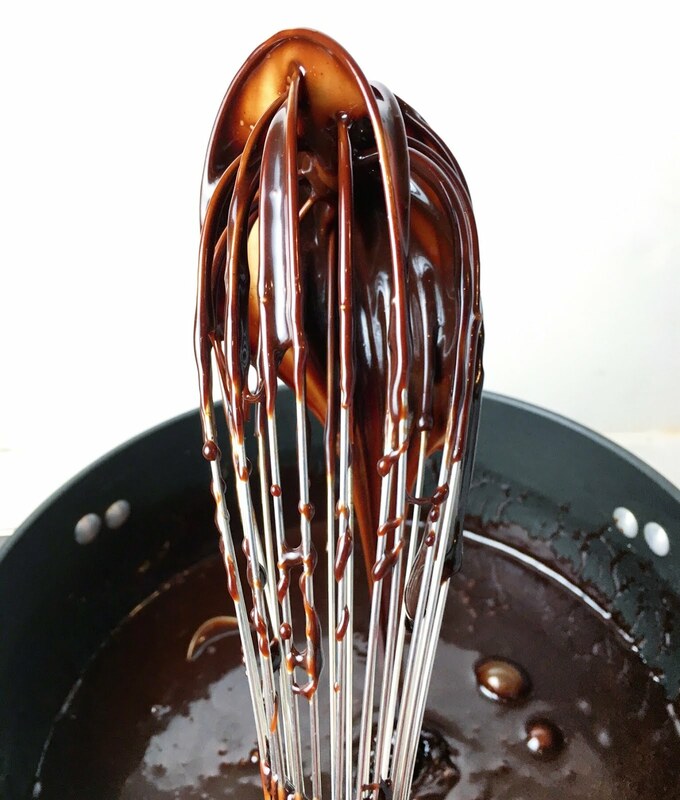 This Nutella Chocolate Caramel Sauce is very thick and can be used at room temperature like a Ganache Cake Filling, or it can be warmed and used as a sauce. And as with any recipe, this Nutella Chocolate Caramel Sauce can easily be modified for personal tastes and different uses. Add more Cream for a thinner Sauce. Use less Cocoa Powder for something with a stronger Caramel / less Chocolatey flavor. Or increase the amount of Nutella if you're one of those Gianduja addicts! 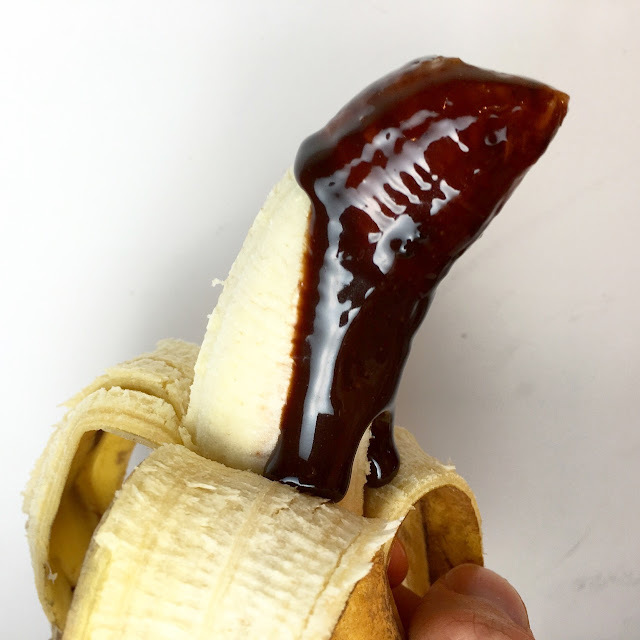 This Nutella Chocolate Caramel Sauce recipe is for an upcoming Hazelnut Banana Cake. The thick consistency makes it a great Ganache-like filling, but it can be gently heated and used more like a Caramel Sauce. The base for this Nutella Chocolate Caramel Sauce is... well, Caramel (read here for more Caramel-related tips and techniques). Heat the mixture of Sugar, Water and Corn Syrup / Glucose to approximately 360 - 370 degrees Fahrenheit (182 - 188 degrees Celsius). At these temperatures, the Caramel will be a rich amber color with a deep flavor, although I advise against taste-testing something that is 370 degrees! Recrystallization is always a risk when making Sugar-based products. Do not stir the pot until the mixture begins to turn amber - a sign that the Sugar is breaking down and starting to caramelize. Making Caramel with some Corn Syrup or Glucose (invert Sugars) mixed with the White Granulated Sugar helps to prevent recrystallization. It's not a critical ingredient, but it helps! Typically a Caramel Sauce is thinned with Heavy Cream. For this Chocolate incarnation, a mixture of Cream and Cocoa Powder is used. Cocoa Powder is notorious for clumping when mixed with a liquid. To avoid lumps, it's best to create a slurry - a paste made by slowly pouring the Cream into the Cocoa Powder while stirring gently. This recipe calls for using 20% Cocoa Powder to Cream by weight. This makes a very thick paste and results in a strong Chocolate flavor. Use less Cocoa Powder for a less Chocolatey / more Caramel flavored Sauce. When the Caramel approaches the target temperature, remove the pot from the heat. The pot will be extremely hot, and the Caramel will continue to cook. Slowly add the Cream and Cocoa Powder mixture to the Caramel while whisking vigorously. Be careful while whisking as the Cream will steam and cause the extremely hot Caramel to bubble. Continue whisking the Caramel Sauce until it is smooth. While the Chocolate Caramel Sauce is hot, stir in the Butter and Salt until well incorporated. Next, stir in the Nutella. Use more Nutella for a stronger Hazelnut flavor. However, using more Nutella will results in a thinner Sauce because of the high fat content. Set the Nutella Chocolate Caramel Sauce aside to cool, stirring occasionally. Store the Nutella Chocolate Caramel Sauce in an airtight container in the refrigerator for up to a month or in the freezer for several months. The cold Nutella Chocolate Caramel Sauce is very thick. To return it to a pouring consistency, gently heat it over a double boiler. 1. Combine the Sugar, Water and Corn Syrup (or Glucose) in a large pot over medium-high heat. Brush the sides of the pot with a wet pastry brush to remove any stray Sugar granules. Chef's Note: Once the pot is on the heat, do not stir. Stirring can cause the Sugar mixture to recrystallize. Make sure your pot can hold at least three times the volume of your ingredients. Later, when you add the Cream, the mixture will bubble dramatically. If the pot is too small, the Caramel will spill everywhere. 2. Make a slurry (i.e. a paste) with the Cream and Cocoa Powder, slowly adding the Cream to the Cocoa Powder while stirring gently. 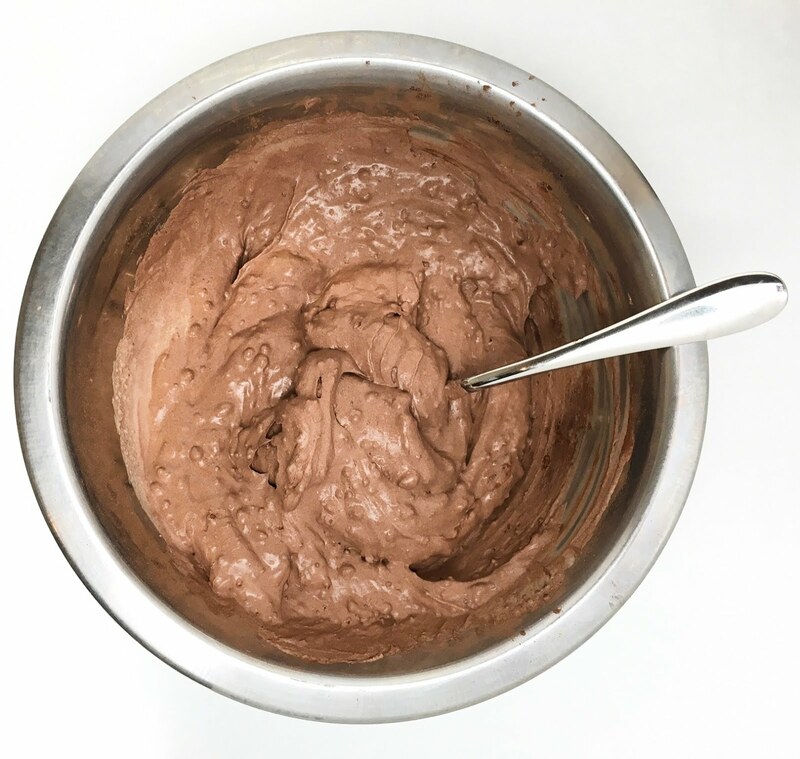 Chef's Note: Slowly adding the Cream to the Cocoa Powder while stirring helps to create a smoother mixture without leaving dry lumps of Cocoa Powder. 3. Continue heating the Sugar until the mixture begins to turn a golden amber. At this point, it is okay to stir gently to redistribute the heat if necessary. Continue heating the Caramel until it turns a deep amber or to approximately 360 - 370 degrees Fahrenheit (182 - 188 degrees Celsius). Chef's Note: As the Caramel continues to cook, the rate at which the temperature rises will increase. Keep an eye on your heat and be ready to remove the pot from the stove as you approach your desired color. Remember that the Caramel will continue to cook even after the pot is removed from the heat. 4. When the Caramel has reached temperature, remove the pot from the heat and slowly pour in the Cream and Cocoa Powder mixture while whisking actively. Do not pour too much of the mixture in at one time. The mixture will steam and bubble dramatically, and the pot could overflow. 5. Once all of the Cream and Cocoa Powder mixture has been incorporated, add the Salt and Butter, and stir until combined. When the Butter is fully incorporated, add the Nutella and stir until combined. 6. Set the Nutella Chocolate Caramel Sauce aside to cool and thicken, stirring occasionally. 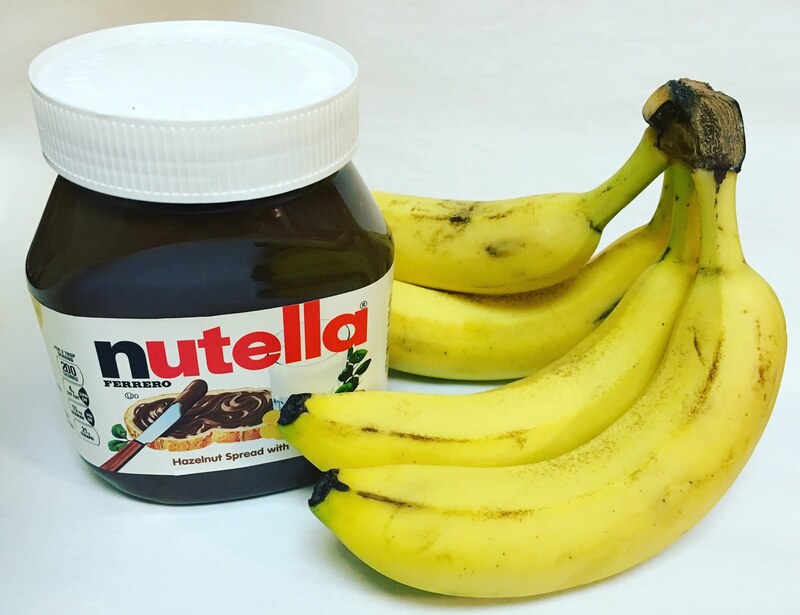 - Store the Nutella Chocolate Caramel Sauce in an airtight container in the refrigerator for up to a month or in the freezer for several months. - The cold Nutella Chocolate Caramel Sauce is very thick. To return it to a pouring consistency, gently heat it over a double boiler.